The Australian National Botanic Gardens (ANBG) in Canberra is inviting expressions of interest from architects to design a new conservatory in the heritage-listed gardens. The proposed conservatory – to be named the Ian Potter National Conservatory – is one of the key recommendations in a 20-year masterplan by Taylor Cullity Lethlean (TCL) and Tonkin Zulaikha Greer (TZG), which aims to reverse the trend of declining visitor numbers that has plagued the ANBG since 2007. 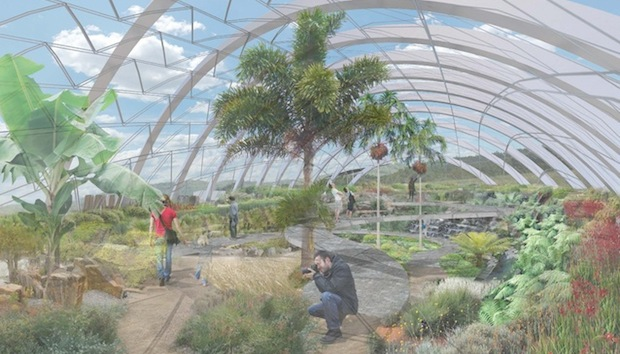 The conservatory is intended to be a showcase of tropical Australian native flora and will expand the ANBG’s capacity to conserve and display its comprehensive collection of Australian native plants. Up to four teams will be selected to participate in the competition. A jury headed by architect Richard Johnson will be judging the entries. Expressions of interest close on 5 May 2016. Selected teams will have until 7 July to submit their designs and a winner will be announced on 18 July 2016. The conservatory is the first project in the twenty-year masterplan to get underway. Construction is expected to commence in 2017 and the project is scheduled to open in early 2018. The project is being funded by the Australian Government and a $1.5 million grant from the Ian Potter Foundation. The masterplan will be implemented in three stages. A national seed bank and bushwalking trails connecting the ANBG to the National Arboretum, also designed by TCL and TZG, are to be completed by 2020 to commemorate the garden’s 50th anniversary. The ANBG masterplan also proposes a new visitors’ centre, cafe and function centre, a wedding garden, an amphitheatre, a treetop adventure ropes course and an eco lodge. The federal government has committed $5 million of the $25 million needed to realize the plan.